” Complete Engineering is a tag line for e-mug, our philosophy is to “start small and grow along and deliver value” has been deeply rooted into our systems and process, this uniqueness has made us a partner for many of our customer where we have been part of their team for over a decade. Our commitment, Continuous improvement and Business excellence has been very successfully with our customers as we incline to work with them on the long term basis, our Macro Management on vital few and Micromanagement on trivial many has helped us to understand the methodology and process of the customer and provide a best in class solutions for the same. This does not happen overnight and without customer support. Thanks to our customer partners who had chosen us and hand-held and helped us to grow along with them. Our Philosophy is to “”Start Small, Grow along with Customer and Deliver Value”” this can be split into 5 Main Milestones. Explore: “You can do very little with faith, but you can do nothing without it” – For any engagement to start; we need to give generous time to understand and present our complete status. We engage with the customer and do the complete due diligence about the requirements and also provide complete insights on e-mug capabilities, Success stories and also take up no risk pilot and deliver results. Collaborate: The Second Milestone is to setup a task force team at both customer end an e-mug end the next step is to define process for some vital parameters like Seed Team Setup, Communication Protocol to kick start the collaboration with customer team. As per the ISO defined process setup the complete project documentation and as per business needs evolve a business model. It is important to understand and assimilate the customer specific standards, process, and product. A service level agreement (SLA’s) is drafted on the various parameters and signed off by both the parties. This collaboration time helps us to exchange both professional and cultural practices. 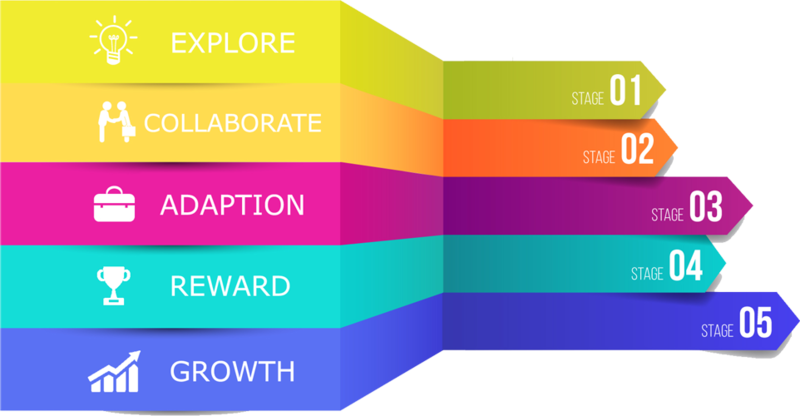 Adaption: Most important phase in the engagement is to adapt the specific process and know-how; we at e-mug give a real push to ensure that the team is acquainted to the requirements and then start delivering according to agreed SLA’s. Governance calls are arrange to exchange and monitor the progress, any issues and challenges are addressed at the root cause. Maturity level is dependent on the scope, however; our experience and expertise makes the time to be reduced drastically. Once, the complete project and process are stabilised and started to deliver value to the customer then the next phase is open for exploration. Reward & Growth: Once we win confidence over customer and started to deliver the value, we take the engagement to the next level. This is most rewarding phase of the engagement for both the partners as things starts moving towards the destiny. e-mug positions not just as service & Solution provider but as a design partner. The next phase is to grow with the customer. In the growth phase e-mug ensures to work on reducing the cost by continuous development, implementing smart methodologies and ensure perceived quality.